Waves are usually formed when water is pushed by winds. In other words, wind energy creates waves. Waves can also be formed by energy from earth movements, such as an underwater earthquake. The water itself does not really flow along with the wave, but instead moves in a rolling fashion as the energy passes through it. This is similar to when you send a “wave” down a rope held between two people. The rope just moves in place, it doesn’t actually travel in the direction of the wave. 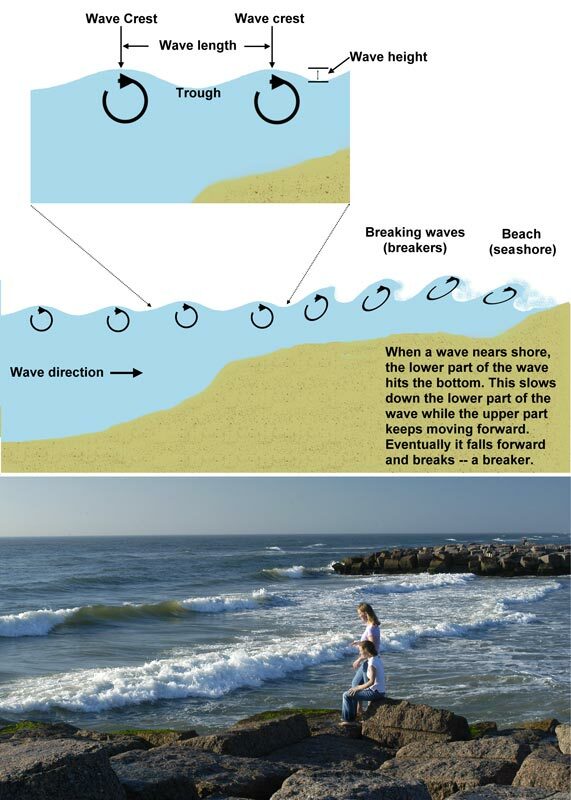 A wave can travel for thousands of miles, but when it nears shallow water, such as shore, the bottom of the rolling motion begins to touch bottom. The lower part of the wave slows a bit while the upper part keeps going. At this point, the faster water on top begins to tip over, giving rise to the curl on large waves as they come to shore. This is why waves “crash” on the beach.